Well, I made it to the weekend. No workshops. Sun is shining and it's a lovely day. Guess what I'm going to do for relaxation? Edit a book! 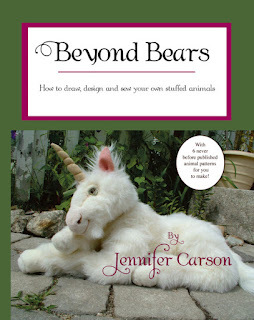 Jennifer Carson's stunning new book, Beyond Bears, is nearly ready for publication. You can read more about the book on Jennifer's blog, or pre-order your copy already in her Etsy shop. I'm not letting any cats (tigers, elephants...) out of the bag before the publication date, but I can tell you that this book will become a classic in the collection of any serious soft toy maker. Glad you are having a relaxing weekend with sunshine. We had a terible storm here last night and it has rained most of the morning. It is now so misty you can hardly see in front of you, and I am supposed to be showing someone the plots that are avilable. Wish I could just climb into bed with a good book. Have a wonderful, restful and fun weekend. I love the cover of Jennifer's book - what a sweet little face. The new book looks exciting. I am popping over to Jennifer's site right away.